Eeyore: "Good morning, Pooh Bear," said Eeyore gloomily. "If it is a good morning, which I doubt," said he." Eeyore: "End of the road. Nothing to do, and no hope of things getting better." Eeyore: "This writing business. Pencils and what-not. Over-rated, if you ask me. Silly stuff. Nothing in it." Beckett: "Every word is like an unnecessary stain on silence and nothingness." Eeyore: "After all, what are birthdays? Here today and gone tomorrow." Eeyore: "We can’t all, and some of us don’t. That’s all there is to it." 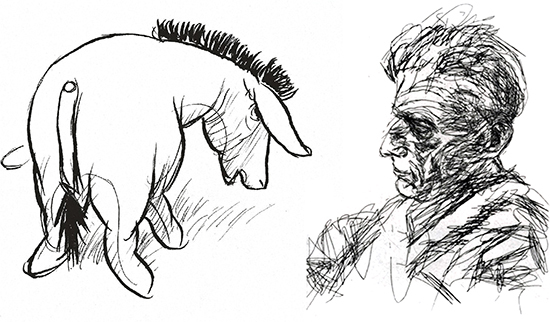 Images: Eeyore drawing by E.H. Shephard. Sam Beckett by Avigdor Arikha.